It was already 11am and our bus had screeched to a halt around 2am that morning. When I woke up, I first thought we had broken down, but then I saw the long line of tractor trailers, engines off, packed like sardines, one after another. Traffic was frozen. It felt like the greatest traffic jam in the world. When Basque photojournalist Borja Lázaro Herrero went missing in Colombia’s Guajira province in early January, it was Colombia’s GAULA who investigated. GAULA (Grupos de Acción Unificada por la Libertad Personal) is Colombia’s elite anti-kidnapping unit, a special division of Colombia’s military born in 1996 in response to a rising wave of kidnapping and extortion events throughout the 1980s, 90s and into the 2000s. According to Dialogo Americas, GAULA has started training other countries in Latin America against kidnapping and extortion, especially in Central America and Mexico. GAULA officers have spent more than five years training Honduran security forces in San Pedro Sula and Tegucigalpa. GAULA officers are helping Honduras develop a professional anti-kidnapping unit and an anti-extortion team, according to Guatibonza. 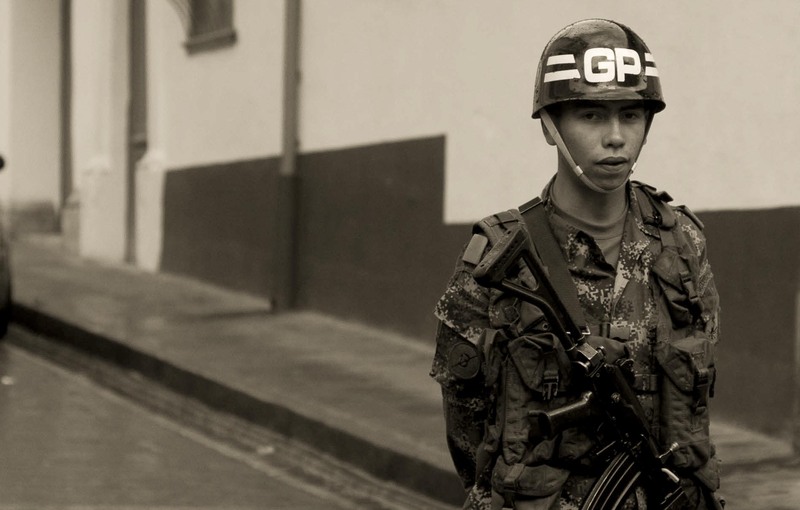 The Colombian military has plans to engage in anti-extortion training programs in 2014 with Guatemala and Mexico. In early September 2013, Colombian Marines trained members of the Honduray Navy in maritime interdiction of drug traffickers. The training took place on board the ARC Caldas, a Colombian missile frigate, in Puerto Cortes on the Northwest coast of Honduras. In addition to those training efforts, the Colombian Air Force and the Honduran Air Force have an agreement to exchange intelligence and participate in joint training programs, said Gen. René Osorio Canales, the leader of the Honduran Armed Forces. The Colombian Air Force has agreements with Mexico, Brazil Panama, the Dominican Republic, and Peru to cooperate in the fight against drug trafficking. Colombia’s interest in exporting GAULA’s expertise outside of Colombia reflects the fact that the ugliness connected to illicit drug-trafficking has quieted down some in Colombia. But it’s not gone from the region. Stepping off the bus at a station called Escuela Militar, I can be certain that I will see two or three young men dressed in dark green canvas fatigues wearing hard faces and patrolling the platform. The police, like the rest of Bogotá, rush past me at the station. Their seriousness fits nicely into the city’s Andean chill. I can also be certain that a Colombian flag will be flapping somewhere high above the white stucco Spanish colonial architecture that hides behind high barbed-wire walls and keeps a wary eye on the outside world from armed military police towers. Across the road, this is the Escuela Militar. The Escuela Militar des Cadetes, founded in 1976 is one of several military institutes in Bogotá that trains young people for service in the Armed Forces of Colombia. It is required of young cadets to spend at least 12 months in the National Police Service before completing their study. Today, as I strolled across the platform to make my transfer, two policemen stopped me and asked me for my cédula extranjería. I knew what they meant. They wanted to check my alien identification card – the one I didn’t have. One of the most surprising parts about life in Bogotá is how militarized the city is. Colombia’s National Police force populates the public transit platforms in Bogotá. In addition to police presence at transit hubs, there are many areas where armed soldiers clad in fatigues patrol every other corner. The strong military and police presence is the manifestation of President Santos’ iron-fisted emphasis on civilian security. Another surprise to note is that the force tends to be made up of young men of no more than 25 years old. The young cadets are responsible for answering questions about directions. At times, they might help an old woman onto the bus before the doors snap shut. Their faces appear non-threatening and they move about on the platforms seeming listless and distracted. Almost every face looks young – almost innocent. Not the face in front of me though. The bright neon green jackets stared at me. I knew what they meant when they asked for my cédula extranjería. They wanted to verify my Colombian alien identification number – the number that the government uses to keep track of foreigners who enter the country for brief periods of time – people like me. One of the primary duties of the National Police is to behave as permanent sentinels for the city’s transport system and to verify that the people using it are indeed registered residents of Colombia. Having an identification card, like having a passport, is a means of proving that you are not guerrilla, not rogue, not the bad guy. I wasn’t the bad guy, and I knew it. But I still didn’t have my identification card, and that could be justification for – well – anything. They stared right at me. A heavy hand waved at me to come toward the stare. I looked back at the two men. The one who asked for it was older, and wore a hard face, and he stared at my waist, not my eyes. He was waiting for me to take out my wallet while the younger one looked afraid and held a clipboard in his hands. He looked like he was waiting for something to happen. Maybe he’s in training I thought. Maybe this is just a little drill. Maybe this won’t amount to anything. I reached into pocket and pulled out my wallet. I took out an old shabby, wrinkled-up copy of my passport and handed it over to the officer. It was so worn out that you couldn’t make out my full name. Trying to feel brave, I hurriedly explained that I had just arrived in the country three days ago and that I don’t have my passport with the cédula extranjería stamp and identification number. I explained that the only form of identification I had is a copy of the first page of my passport. My mind went numb with a storm of possibilities over what was going to happen next. Fear drowned my focus. I felt like one hundred eyes were fixed on my wallet, the unmoving faces of two National Police officers, and the winkled passport in my hand. The older officer took the document from my hands. It almost fell apart as he unfolded it. I entered a profound certainty that I was in danger of being seized by the National Police and tried to prepare myself for the ensuing confusion of having to explain my case. My body tensed. All I could smell were the fumes that spewed out of the buses roaring past. Noise thundered across the platform. It almost muted the officer’s next response. I leaned in and strained to catch everything that ran across those moving lips. “Thank you, kind sir,” he said, and handed back the copy of my passport. As he did, a piece fell to his feet. The younger officer quickly bent down and snatched it, jumped up to his feet, and handed it to me. I looked at him. A wave of relief rushed through me. I told him thank you in return. Then I hustled off to catch the next bus back to my house in the Palermo, where my lunch would be waiting for me. I knew it would already be cold when I arrived.